This exhibition took place at Casey Droege Cultural Productions in Pittsburgh, PA as a concurrent exhibition during the NCECA conference 2018. In addition to finished work we included some of the models and tools that were fabricated during the residency. As part of a past residency at the Maryland Institute College of Art with Mat Karas, Kala Stein and Seth Payne we explored digital fabrication as a means of studying and responding to historical architectural brick and terra-cotta in the neighborhood of Bolton Hill in Baltimore, Maryland. Pictured here are some of my experiments in capturing these sites. 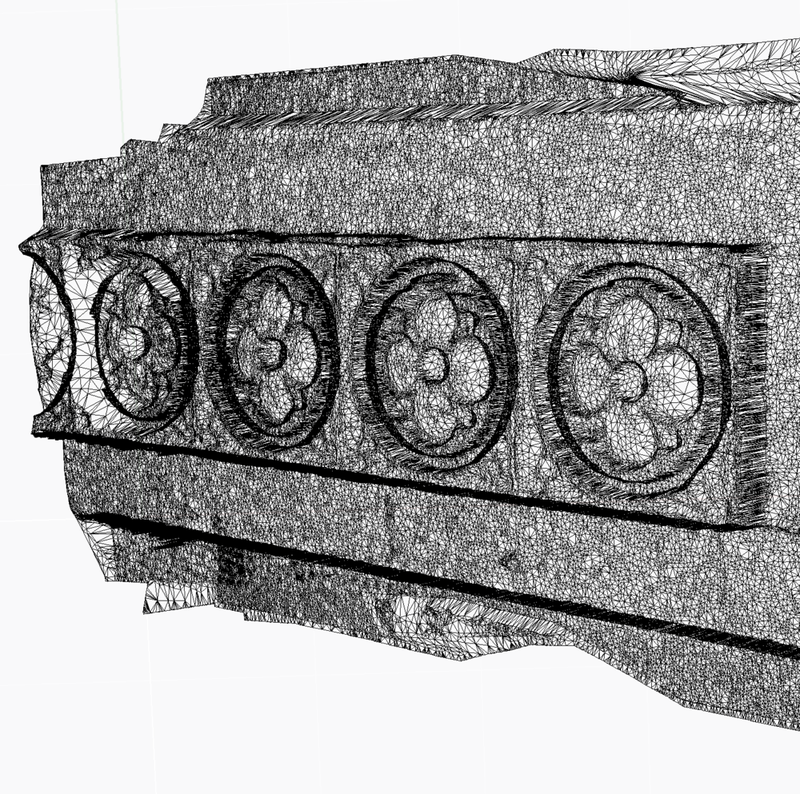 The meshes below are details from larger 3D scans of architectural facades. These meshes were then used as imagery to laser-sinter glaze material onto ceramic tile. Much of my research during this residency was the exploration of 3D scanning and how the various layers of data produced from this process could be applied. With Bolton Hill as the subject, I became drawn to the plant life that adorned and in some cases seemed to take over the brick facades. The movement of leaves at this site produced glitches in the scanning process which became a focus of both the 2D and 3D print shown. Another technique which I explored during this residency was the laser-sintering of glaze. I used linework extracted from photographs of the this site to selectively melt glaze onto terra-cotta slabs. Thereafter I applied ceramic decals to build up selections of color upon the linear mesh.